Even befo­re SILAG Wareh­ouse Sales ope­ned its doors at 10.00 sharp on Thurs­day 25.6.2009 gre­at num­bers of curious bargain‐hunters were wai­ting at the ent­ran­ce. The ope­ning cele­bra­ti­on had been plan­ned in every detail for weeks and adver­ti­sed in the who­le of the area sur­roun­ding Lan­gen­feld. Lar­ge hoar­dings, leaf­lets, adver­ti­se­ments, HGV sti­ckers and a new web­site announ­ced the three‐day event con­spi­cuous­ly. The­re were many full shop­ping trol­leys. Sel­ling like abso­lu­te hot­cakes were main­ly items such as kit­chen rolls, dol­lies at an unbe­liev­a­ble €10 or the Fly­mo multi‐function app­li­an­ce, redu­ced by 60%. But it wasn’t just the arti­cles redu­ced in pri­ce by up to 75% that temp­ted the visi­tors in their dro­ves; the food‐and‐drinks vans of the “Alt Ohligs” bre­we­ry also pro­ved very popu­lar. The employees of neigh­bou­ring com­pa­nies also took the oppor­tu­ni­ty to visit in the lunch hour so that each day up to 1000 “Brat­würs­te” pas­sed over the coun­ter at the in‐house Curry‐ Sau­sa­ge Stand. Ano­t­her high­light enjoy­ed by the custo­mers was the oppor­tu­ni­ty to take part in an ani­ma­ted memo­ry game. A pro­fes­sio­nal enter­tai­ner soon rou­sed the play­ful instinc­ts of both young and old and rewar­ded speed with gre­at shop­ping vou­chers. The SILAG Han­del AG trai­nees also gave ster­ling sup­port to the Wareh­ouse Sales team. They dis­tri­bu­t­ed gummy‐bears in the shape of amu­sing euro sym­bols, colour­ful bal­loons, pens or long‐stemmed arti­fi­ci­al flowers, which delight­ed ever­yo­ne not just the ladies. SILAG Han­del AG again demons­tra­ted its feel for the cur­rent eco­no­mic cli­ma­te with this sen­sa­tio­nal ope­ning. Its tho­rough­ly suc­cess­ful busi­ness model enab­les it to react to chan­ged frame­work con­di­ti­ons even in times of cri­sis for the who­le eco­no­my and thus to deve­lop new paths for tra­de and indus­try. Thus, for examp­le, new pro­duc­ts are con­stant­ly being tested for accep­tan­ce by the end con­su­mer in our own Wareh­ouse Sales befo­re they are tra­ded across the who­le of Ger­ma­ny. Tog­e­ther with the sale of excess stock, a wareh­ouse sales con­cept has been deve­lo­ped from this which has now been estab­lished in the Langenfeld/Solingen area for more than 15 years and is fore­cast to gar­ner ever more sup­port in the future. The SILAG Han­del AG lea­dership is hap­py to have found a site for Wareh­ouse Sales that is more sui­ta­ble not only for logisti­cal rea­sons. After the com­pa­ny despi­te inten­si­ve efforts had to relin­quish the tra­di­tio­nal site in Solin­gen at the end of May, a wareh­ouse right next to the SILAG head office was con­ver­ted into a modern sales wareh­ouse. 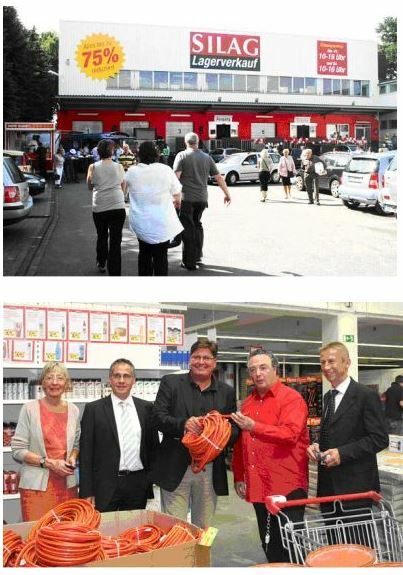 The Mayor, Mr. Magnus Sta­eh­ler, came to see the ope­ning days of the new shop­ping desti­na­ti­on in Lan­gen­feld for him­s­elf. Mr. Lapa­wa used the oppor­tu­ni­ty to offer his thanks again for the col­la­bo­ra­ti­on with the City of Lan­gen­feld, wit­hout which this suc­cess­ful move would not have been pos­si­ble.